Q. I have an old CD and I can't get it to install on Windows 7 or 8. A. If you are trying to install from one of our older CDs on Windows Vista/7/8, the CD menu installer does not work in Vista/7/8. You need to view the files on the CD and run the "gdsol.exe" file in the goodsol folder on the CD to install. CDs from 2007 and later will not have this problem. Q: I use a Mac and the toolbar with the undo, redo buttons is missing. How do I get it back? A: If you have Lion or higher, go to the Window menu and select "Show Toolbar". For Leopard or Snow Leopard, click on the little grey oval in the upper right corner of the window to turn the toolbar on and off. 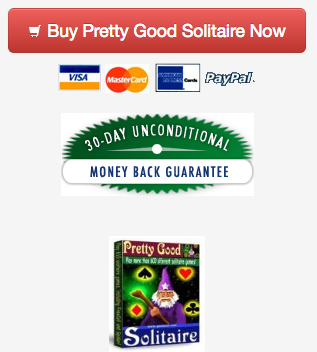 Q: In Pretty Good Solitaire, how do I delete games from the Favorites list? A: Click on the Options button on the main screen, go to the Groups and Wizard area, and highlight Favorites on the left side. You can then add or delete games on the right side. Note that you can also create your own groups of games here and add or delete games from the groups. Q: I have a new computer. How do I transfer Pretty Good Solitaire from my old computer to my new one? A: First, install using the original setup installation file (copying files over will not work). If you don't still have that, you can download the trial version from http://www.goodsol.com/download.html and then use your registration code to register it (if you have purchased). To copy your statistics, you need to copy the entire data folder. The data folder location depends on the version of Windows. 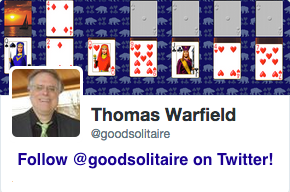 In Vista/7/8, it is usually the C:users[Windows User name]AppDataRoamingGoodsolPretty Good Solitaire folder. In Windows XP, it is usually the C:Documents and Settings[Windows User Name]Application DataGoodsolPretty Good Solitaire folder, where [Windows User Name] is your user name for Windows. An easy way to find the data folder is to click on the start button, select "Run...", and type "%appdata%" (without the quotes) and click on OK. Windows will take you directly to the Application Data area. Q: My cat jumped on my keyboard and lost a game, what can I do? A: First, tell your cat to stop playing solitaire, they are really bad at it. I don't think I've ever had an email from anyone saying that their cat has won a game. Second, click on the Options button on the main screen, go to the Preferences area, and check the box "Confirm new games and restarts". On a Mac, click on the Preferences button, go to the General tab, check the box "Confirm when starting new games". This will keep this from happening in the future. This game is at Northwest Territory.